Yesterday brought the expected flood of April Fool’s jokes, like news that the 188-year-old Guardian newspaper would be switching from ink to Twitter or that the special ingredient in this week’s A.V. Club Taste Test was ejaculate. But sometimes even a good joke can backfire in unexpected ways, and that’s what happened to the wisenheimers over at ThinkGeek.com, who announced a fake product that it turned out everybody wanted. Star Wars fans—and they are still legion, despite over 20 years of nonstop setbacks—fondly remember a sequence in The Empire Strikes Back on the planet Hoth, an arid wasteland characterized by deadly sub-freezing temperatures. In order to save Luke Skywalker from certain death, Hans Solo carves opens the dead carcass of a Tauntaun (described on the Star Wars “Wookieepedia” as an “omnivorous reptomammal” that the Rebel Alliance used for transport) with his Lightsaber and tucks his little buddy inside. Sure, it stinks to high heaven, but nestled under the Tauntaun’s thick skin and warm intestines, Luke is saved from a grim fate. 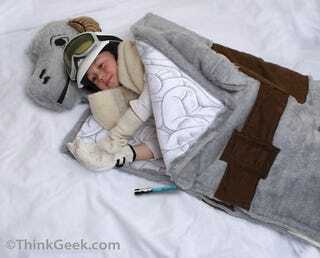 ThinkGeek’s April Fool’s joke was the unveiling of the Tauntaun sleeping bag, a plush replica of the beast featuring a “built-in embroidered Tauntaun head pillow,” “a glowing Lightsaber zipper pull,” and “the exact synthetic compounds needed to recreate Tauntaun fur.” Funny, right? Because who would want to sleep inside an animal’s smelly intestines? Answer: The many, many people eager to fork out $39.99, that’s who! ATTN Tauntaun Fanatics! Due to an overwhelming tsunami of requests from YOU THE PEOPLE, we have decided to TRY and bring this to life. We have no clue if the suits at Lucasfilms will grant little ThinkGeek a license, nor do we know how much it would ultimately retail for. But if you are interested in ever owning one of these, click the link below and we'll try!